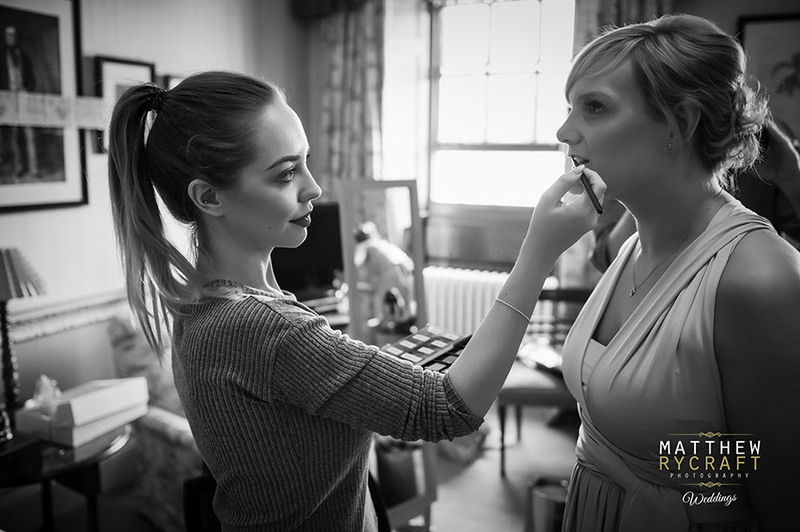 I’ve had the pleasure in meeting and working with the finest Wedding Suppliers in recent years. 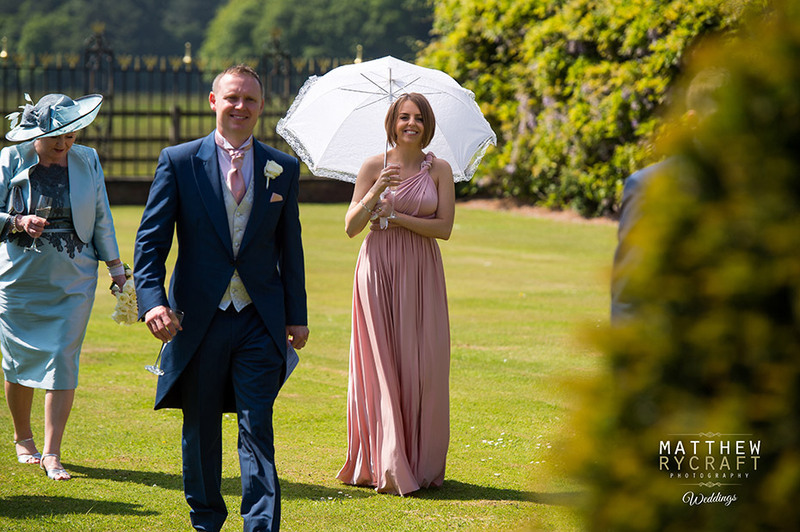 At at a recent wedding at Knowsley Hall, for Alison & Scott, some of the finest Wedding Suppliers made their wedding day at Knowsley Hall so special. 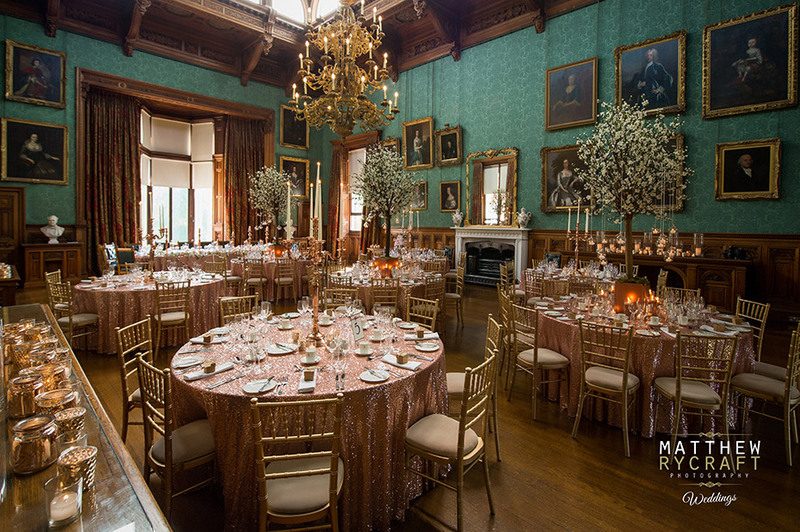 Be Inspired and take a look at a recent list of wedding suppliers from Alison & Scott’s wedding at Knowsley Hall. 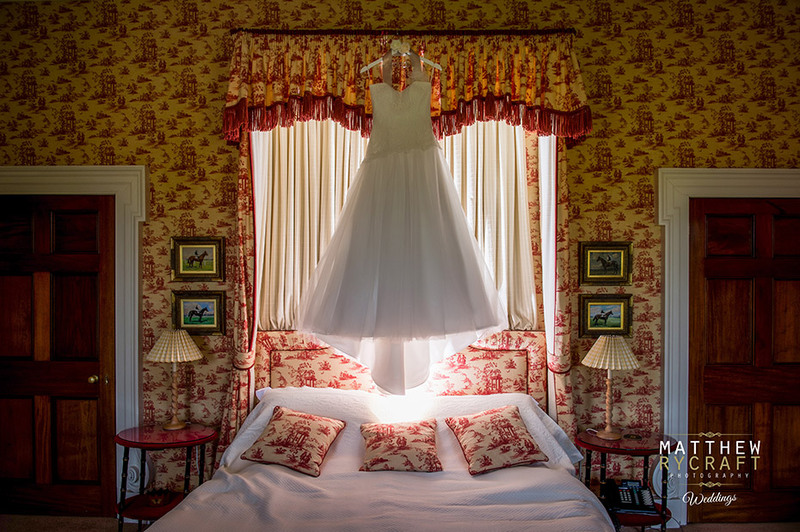 Find out who they used to make their wedding day so special. All Wedding Suppliers are from the North West. A Bride and Groom wanted to utilise a variety of lighting techniques to really showcase the venue, from carefully placed up-lights, to delicate candelabras, large illuminated LOVE letters and the obligatory sparking dance floor to create the sense of floating on stars for our fist dance and all of which helped to create visually appealing environment. We hand selected a playlist with some of our favourite songs from over the years, all chosen to keep people on their feet and dancing the night away. There was a song for everyone and there wasn’t a moment all night when the dancefloor was empty. To make sure that everyone felt involved and were entertained throughout the night, a fun wedding casino seemed to be the perfect choice. It allowed guests to have a little gamble (using fake money) for a chance to win some prizes. Opting for 2 easy to play games that everyone was bound to enjoy – Roulette and Black Jack, with a variety of prizes ranging from sweets and chocolates for the under 18s, to bottles of bubbly and even drinks vouchers to spend at the bar. These also come with personalised casino chips with each day guest getting to keep as a memento of the day. 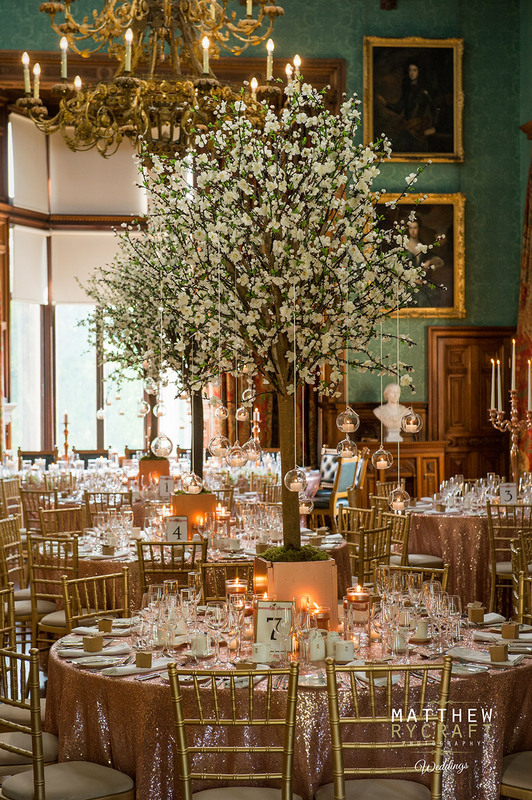 This is a fantastic addition with large crowds gathered around the tables all night. 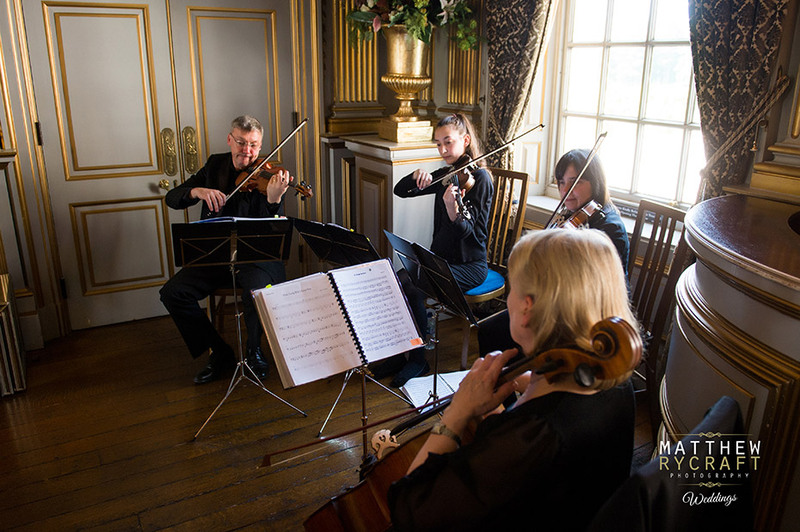 Opt for a professional string quartet to entertain your guests before, during and after the ceremony. 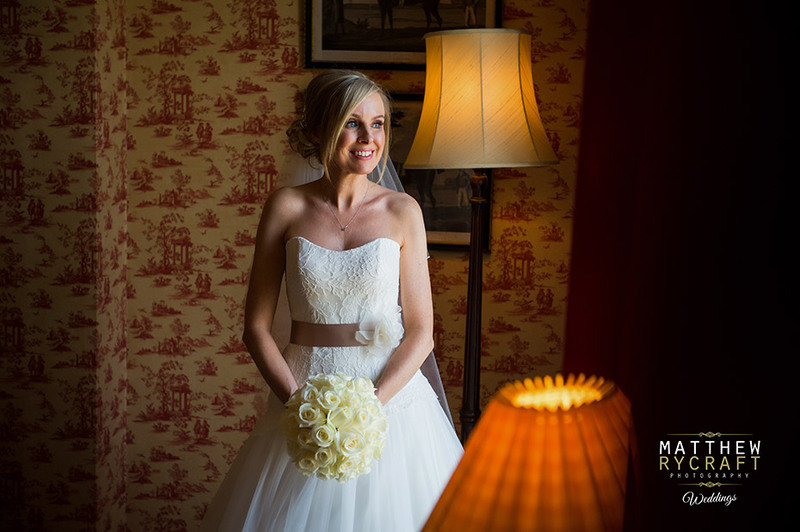 Choosing Pachelbel – Cannon in D is a popular choice preferred processional song to walk down the aisle, along with a selection of your favourites to play throughout the day. How about including ‘1000 years’ during the signing of the registrar and the queen of sheeba (a cheery and upbeat song) to be played as we left the ceremony. 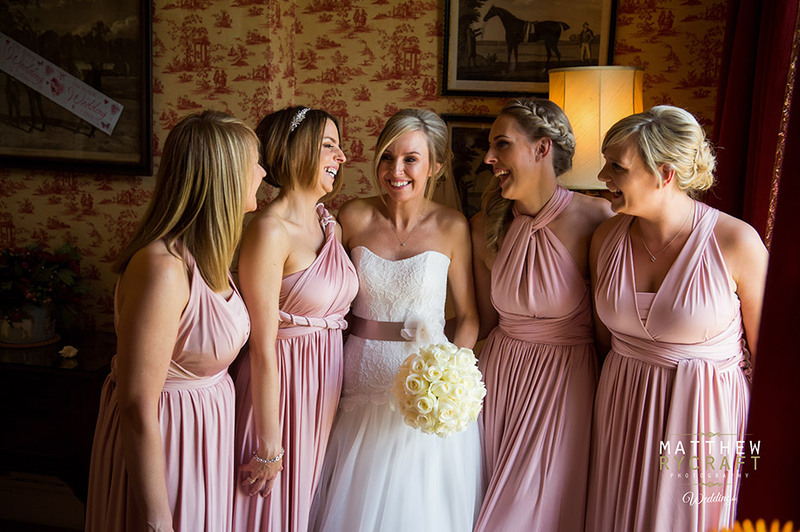 Emma and Melissa styled Alison’s and her Bridesmaids hair beautifully. Making sure the Bride was going to be the bell of the ball. Jessica Mae Mooney was Alison’s right-hand woman. Even going as far to driving back home quickly to pick up part of Alison’s wedding dress, which was left behind. Ooops! Ivory dress layers of lace with pink bow. This wedding dress was so perfect for Alison. 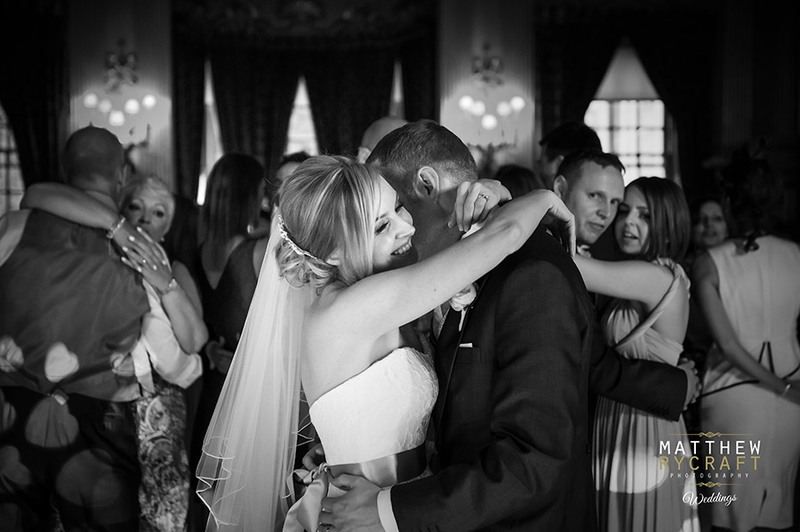 Supplied by Warrington based Bathany Hannah Bridal. Another addition to your evening entertainment is a fun photo booth with green-screen background. 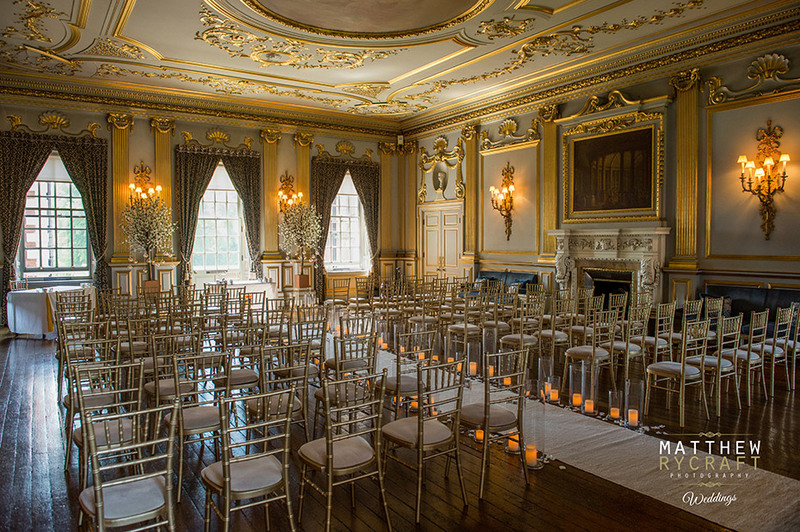 This allowed guests to choose from a variety of preselected images including Knowsley Hall, the Grand Canyon, Las Vegas or hearts and fireworks. The photobooth is ready for the arrival of your evening guests and include a variety of funny and entertaining props from silly hats and wigs, to inflatable guns and bananas. 4 photos are taken in quick succession, giving you only 3 seconds between each shot to quickly change props (providing you were quick enough). You can even request an extra personalised guest book to match your colour theme, which allowed a second copy of the photo to be attached along with a message from your guests to help record the antics of the night! 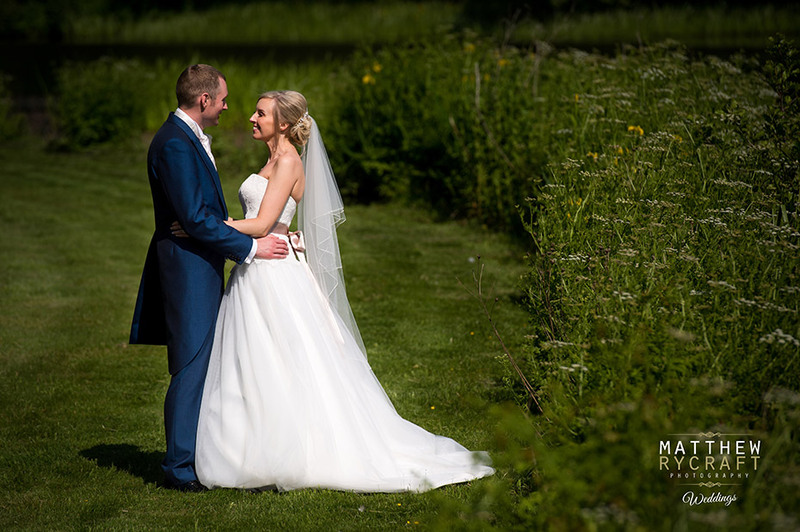 Scott was dressed in a blue mohair tailcoat, silver waistcoat with ivory cravat and matching pocket square, single ivory avalanche rose buttonhole and shiny black shoes. 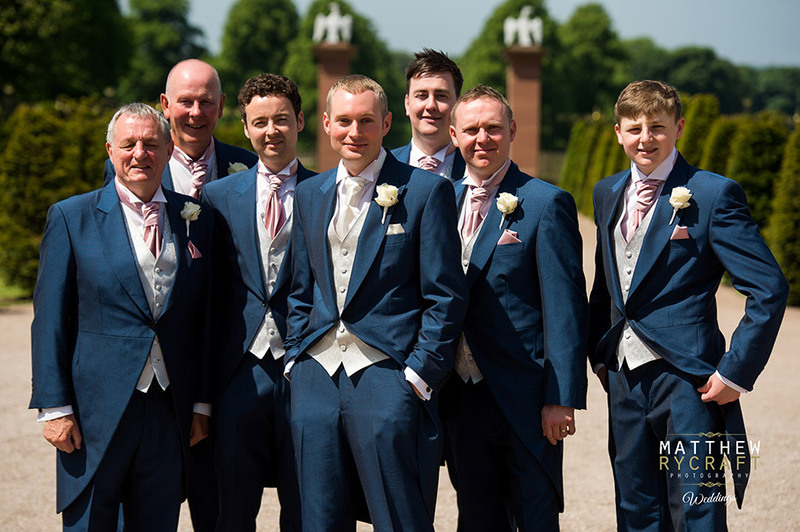 Groomsmen with matching baby pink cravat to tie in with the bridesmaids dresses. 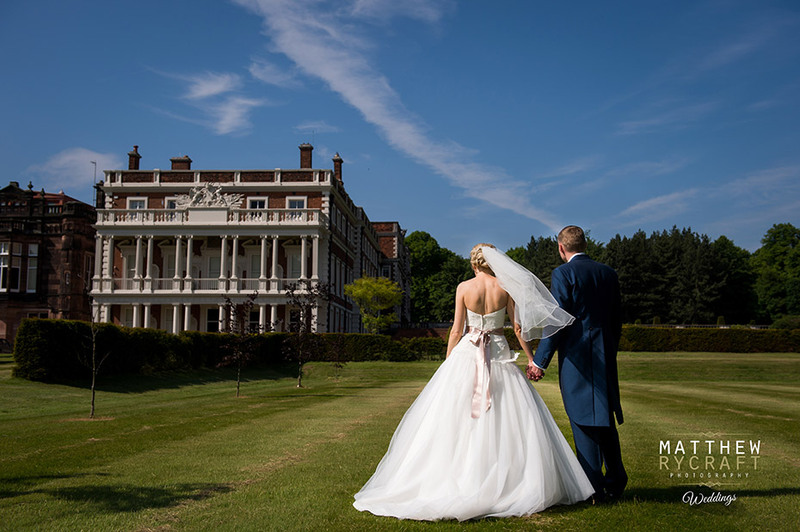 Eliza and Ethan Dusky pink multiway dresses were the choice for this wedding. 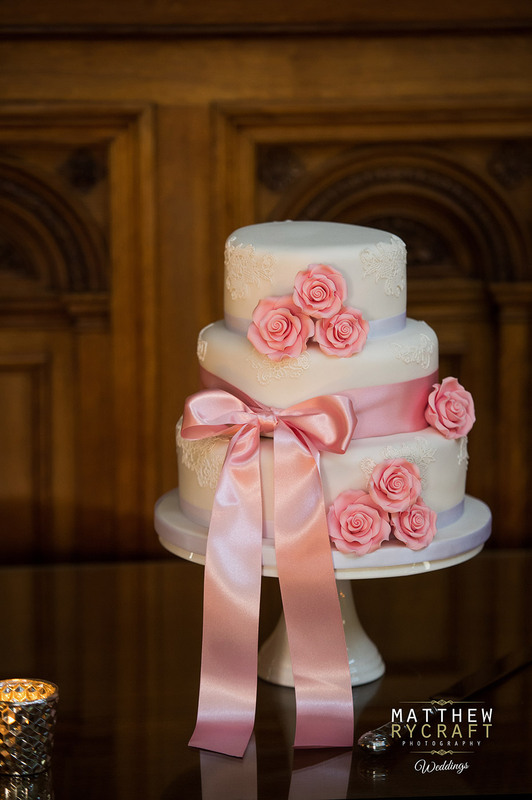 Ivory avalanche roses formed the basis of our floral arrangements with a hand-tied bouquet design, finished in ivory fabric to coordinate with bridal gown. Button holes and corsages for the bridal party, all designed by Red Floral from Manchester. 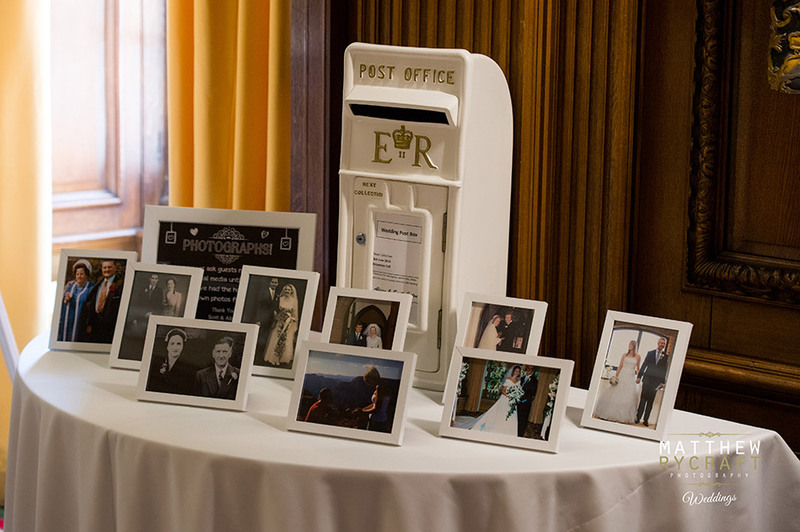 Within the entrance hall at Knowsley Hall, on a half-moon table, we positioned a white royal mail ER post box surrounded by wedding photos of all bridal party including photos of both our grandparents who sadly are no longer with us, but would have loved to be part of our special day. At the front of the photographs we included our own engagement photo, which was captured, as Scott got down on one knee asking for Alison’s hand in marriage. For a more modern twist, we opted for a drop box with individually crafted wooden hearts ready for signing by our guests. This would help us to remember our loved ones who came to share our special day and will be hung up and displayed as a keepsake to remember our day. 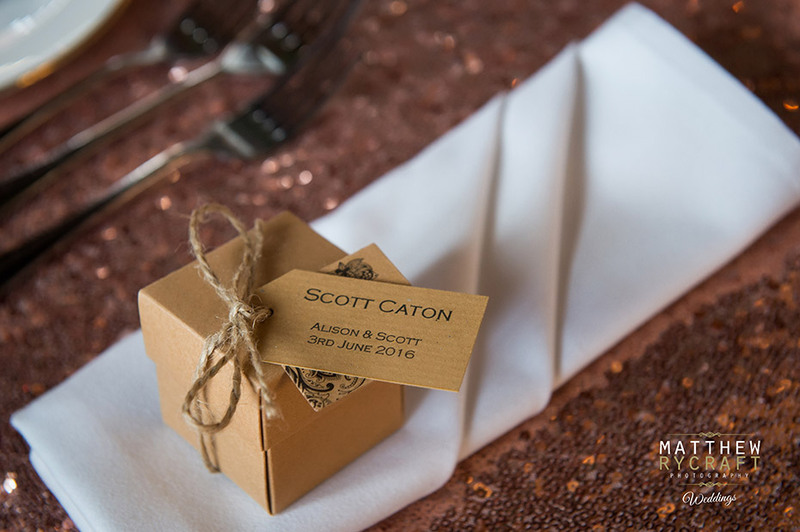 Not wanting to miss out on more sentimental messages or advise, we included a personalised guestbook for guests to leave additional messages for the new Mr and Mrs Caton.